PRESQUE ISLE — A Houlton businessman will again chair the Aroostook Partnership Board of Directors. Chris Anderson, President of F.A. Peabody, was reappointed to serve as chairman at the organization’s annual meeting Wednesday, Nov. 16 at Northern Maine Community College in Presque Isle. 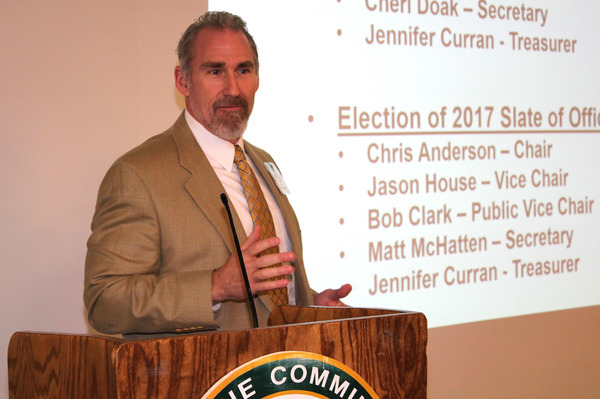 Also, approved to serve as officers in 2017 were Jason House of TD Bank as vice chair, Bob Clark of Northern Maine Development Commission as public vice chair, Matt McHatten of MMG Insurance as secretary and Jennifer Curran of Tempo as treasurer. After a welcome to NMCC by Sue Bernard, Dean of Development at the College, AP board chairman Anderson conducted the official business of approving the officers for 2017. 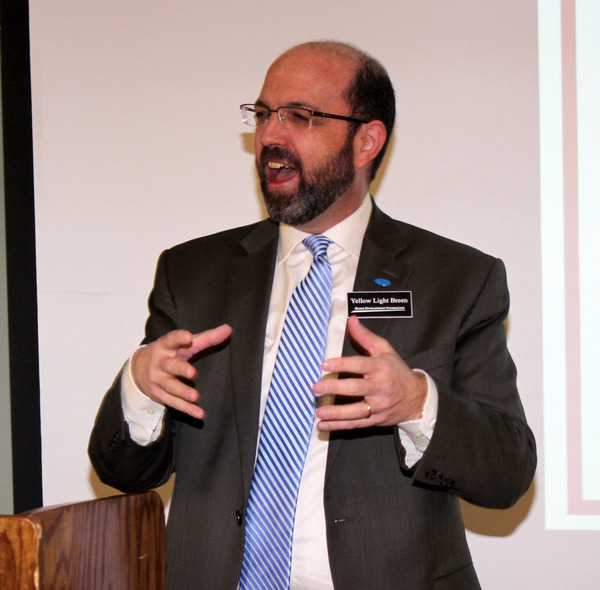 He also addressed the more than 45 attendees on progress the organization has made since the merger of LEADers Encouraging Aroostook Development and Aroostook Partnership for Progress and what makes AP different. “We are the only County-wide organization speaking with one voice on issues affecting Aroostook’s survival, growth and prosperity,” said Anderson. Partnership President and CEO Bob Dorsey outlined some of the challenges facing the region, but also highlighted the positives. Dorsey also used the opportunity to thank the folks giving their time, talent and treasury to better Aroostook. “It is critically important to thank our investors and board members, for without them, we’d have no Partnership, no Clusters and Working Groups to spearhead economic progress and a lot less coordination and collaboration across the County,” he added. To wrap up the annual meeting, Yellow Light Breen, CEO and President of the Maine Development Foundation (MDF), provided the keynote address. MDF is a private, non-partisan membership organization that drives sustainable, long-term economic growth for the State of Maine. Breen said his organization has three core principles of leadership, trusted research and creative cross-sector partnerships. “Maine’s economic context requires brutal honesty and unquenchable optimism,” he said. Breen also advocated for a quality economic plan for Maine. “Let's make sure the plan is driven by the data, instead of driven by our biases or our assumptions," he added. Photos: Upper right, Aroostook Partnership Chairman Chris Anderson. Lower left, MDF CEO Yellow Light Breen. CARIBOU — The forest products industry in Maine is going through a period of adjustment was the consensus of those who attended the latest Northern Forest Products Industry Cluster meeting facilitated by the Aroostook Partnership. “Paper mill closures downstate, depressed softwood prices and other challenges dominate the headlines, but there are some positives, like investments by Aroostook County mills and a pilot project for Aroostook County, which should make it easier for logging companies to move equipment at night,” said Partnership President and CEO Bob Dorsey. More than 20 business owners, industry representatives, bankers, educators and economic development officials attended the cluster meeting Wednesday, Nov. 16 at Northern Maine Development Commission in Caribou. Yellow Light Breen, CEO of the Maine Development Foundation (MDF), who earlier in the day attended the Partnership’s annual meeting, was asked to give a presentation on the status of the federal Economic Development Assessment Team (EDAT) inquiry in the forest products industry in Maine. In a partnership with the Maine Development Foundation and the University of Maine, EDAT visited mill sites and small landowners to discuss the opportunities and challenges they face this past summer. They are creating both long term and short term plans regarding Maine’s relationship with global markets, capital investments, and research and development. “We expect to have the initial report sometime in December or before the inauguration of the president-elect in January,” said Breen. He said the key principles for building Maine’s roadmap and responding to the current challenges are to hire a leading international forestry consulting firm with specialized expertise in global wood markets and trends, forest modeling and availability of fiber, plan development from the previous stages into a comprehensive and achievable vision for Maine’s forest sector and a marketing plan that informs potential investors on the business resources and manufacturing site options that might fit their objectives. The cluster was also updated by Dana Doran, Executive Director of the Professional Logging Contractors of Maine; Patrick Strauch, Executive Director of the Maine Forest Products Council; and Rosaire Pelletier, Forest Products Business Liaison for the Governor’s office. The forest products industry represents more than 4,600 jobs in Aroostook County and is the major economic engine of the region. In 2016 the total economic impact of the forest products industry in Maine was estimated to be $8.5-billion. The insurance industry plays a big role in the forest economy of Maine, as such, the latest issue of F.A. 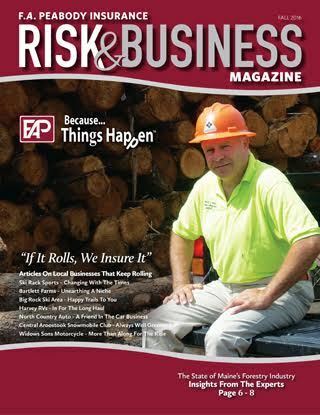 Peabody Insurance Risk and Business Magazine features insights from the experts on the state of Maine’s Forest Industry. F.A. Peabody is a long-time investor in the Aroostook Partnership and President Chris Anderson chaired the Partnership’s asset based strategic planning process Mobilize Northern Maine, which identified forest products, manufacturing, diversified agriculture and renewable energy as sectors of growth potential for the region. To view the fall issue of Risk and Management Magazine, click here.